Jean is having a contest here and there are some pretty cool prizes! Check it out. Contest ends 15Jun2009. This orchid, a gift from V (thanks!!!! ), bloomed so I took the opportunity to snap a pic before it started to die. 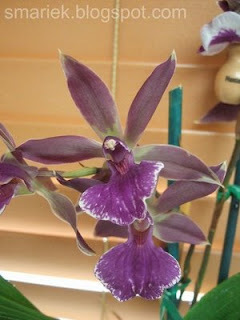 You can get a better look at this type of orchid from this person's better photo (and the name of the orchid type is underneath the pic). I don't know why "blue" is in the name, it really should be "purple". Anyhow, I managed to unearth an old blue colored pot and placed the orchid in that. I think it's a good color match. I used to have a modest collection of orchids at the old house. It was back when I worked at a company that decorated lobby/waiting areas with orchids and other plants. Once the flowers dropped, they would give the pots to anyone who wanted them, otherwise they would get thrown out. There weren't that many people interested in orchids whose blooms have already fallen off. They just couldn't see that the orchids would eventually rebloom someday. However there were some of us who could rescue these orchids from the trash bin. I'd take some of them back to my desk at work. With just the right amount of "neglect" (really!) they will grow and bloom again. Over the years I eventually ended up with around 20 pots of orchids at home (just phals, oncs, & dens, plus one paph). The collection dwindled over time and then I moved. Zero orchids at the new house. V's trying to change that. The purple one you see above is the 2nd one she gave me. ... and it eventually ended up rewound into these 2 balls. Don't they look neat and tidy? I kinda didn't want to undo these balls by knitting from them. It took me four tries to find the right needle size to use for the MSCS I was making with this yarn. The yarn label said US 9 (5.5mm) so I started with that. Nope, fabric way too tight. Definitely did not like this. Tried US 10 (6mm). Just slightly better, still not happy with it. Then I tried US 10.5 (6.5mm). A little better result. Not completely satisfied though. Then I tried US 11 (8mm), even better! Unfortunately I couldn't try it out with US 13 or US 15 because US 11 was the largest size needle I had on hand during my trip to the big lake (see 01Jun09 post). So I ended up using US 11 for the scarf. I worked the pattern as-is, CO30 and knit until I ran out of yarn. 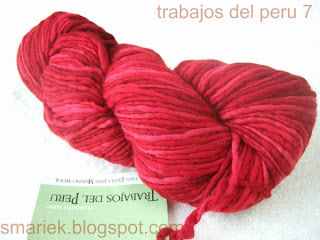 The yarn is a thick/thin type and I think it's a 1-ply(?). I was unsuccessful at trying to spit splice the 2nd ball. I couldn't pull the yarn apart into strands. And the two ends just didn't stick together, they came apart with a bit of pulling. With 2 hanks, 147 yds each -> 294 yds total, the finished scarf ended up being 6" (15cm) wide and 68" (173cm) long. I had to bind off twice. It flared too much the first time, so I redid it. I think the scarf turned out ok. 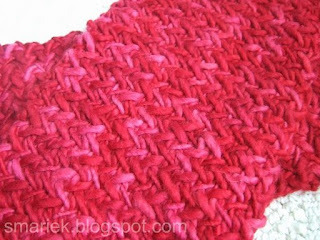 I can see why this scarf has a high appeal, it is a very quick knit on big needles! This is a close up of the front side. The scarf is nonreversible. I still have trouble taking pics of anythinig red colored. Allison had asked where to get this yarn. 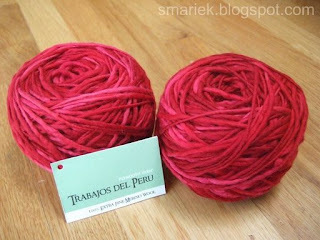 I haven't seen this yarn at a local shop, I had to order it online sight unseen. I had no idea what it would be like, but was pleasantly surprised when it arrived and wished I had ordered more. Thanks for the book rec! Yay, I finally got my hands on Book 3, which is just as well because I haven't been able to get my hands on this book which Megan recommended and described as a modernized 1984. 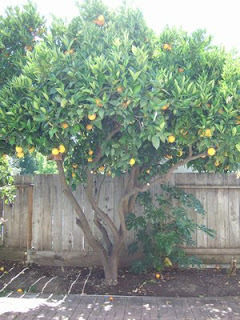 Orange Tree, now overgrown, but still full of oranges. V pointed out that I'm an organic gardener. Haha, I never thought of it that way. 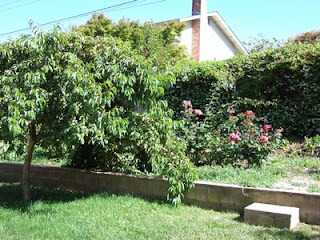 And this is the back yard with a peach(?) tree, and lotsa roses on the elevated portion. The roses have grown positively wild since then. They definitely don't look like the neat tidy rose bushes my neighbors have outside the front of their houses ... you know, the ones with one main stem, and a leafy/flower section at the top of the stem? My rose bushes have grown wild in all directions. I'm starting to prune them back, although I don't know if I'm doing it correctly. I'm just cutting off any dead looking branches for now. They may not look very nice, but the roses sure do smell wonderful! wow I love that scarf! So pretty!!!!! Where are you in the Twilight books? Still on #2 or have you begun #3 yet? Did you ever see the Twilight movie? I had to buy the music CD from the movie. I really got into all that driving and beautiful music! 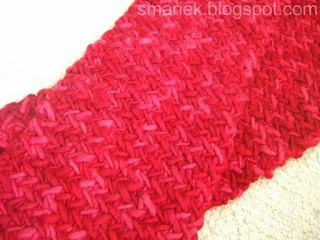 I like the stitch pattern of your scarf. It looks very soft and cushy! Like the scarf, M! Don't prune your roses any more this year, you are late, and the last thing you want is a beetle infestation. and call your local nursery (the GOOD one, not the one at Home Depot) and ask them when roses should be pruned in SFO. Here, it's Valentine's Day, I suspect around St. Patricks for you. The trees are awesome. Living in the midwest, I find it so neat to see orange trees in someone's backyard. The scarf looks really cozy which will come in so handy with the foggy damp days that your area experiences. I agree you are an oraganice gardener, sometimes weeds can be home to beneficial insects and provides places for birds to gather seeds. (I bet you didn't know you were doing all that). After years of my husband holding the yarn while I wound it, he bought me a ball winder! I love it. Sorry to hear about your lemon tree. I just tried making fresh lemonade and it's not bad. lol Maybe you can plant another lemon tree? I can't believe people threw their non-blooming orchids in the trash!!!!!! I'm so glad you saved them. I, too, have orchids, and I love them. They don't bloom often, but when they do, it's well worth the wait. 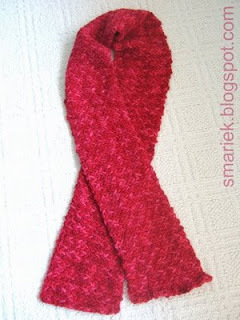 Pretty scarf! For what it's worth, I much prefer rose bushes rambling and "gone wild". Just don't go for the stick with a pom pom on top look. Think English cottage garden. Oh and yes, that yarn is really pretty. Ah, citrus trees! We live in WV and have a few in big pots. A few years ago, one actually bloomed and produced a dozen lemons! We made lemonade, and it was so good. 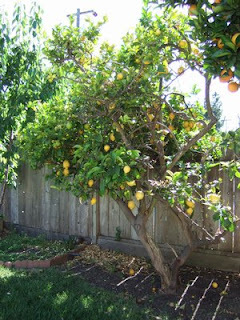 In a couple of years we'll retire to S. FL and have our own yard of citrus, jasmine, etc.etc.etc. Beautiful yarn. I like the stitch, too. Twilight! I was totally sucked into the series and movie. Love them! The scarf is LOVELY!! Thank you sooooo much. The orchid is pretty, glad that you're enjoying it. Gardening can be very therapeutic. Let me know when you're ready for some yard work.